New Pillars Release. Yearly Hexagram Statistics. | Four Pillars of Wisdom. Chinese I Ching Astrology Software. New Pillars Release. Yearly Hexagram Statistics. Four Pillars of Wisdom 1.0.2010.529 is released, and now we have new very nice feature in the program – Yearly Hexagram Statistics. 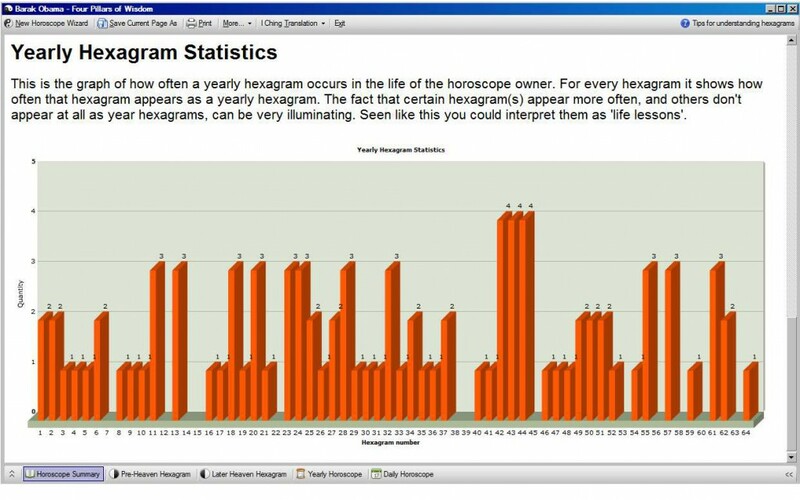 Yearly Hexagram Statistics is simply a cute graph of how often a yearly hexagram occurs in the life of the horoscope owner. For every hexagram it shows how often that hexagram appears as a yearly hexagram. On the X-axis the hexagram numbers from 1 to 64 are displayed, and on the Y-axis the quantity is displayed which shows how many times yearly hexagram occurs in the Yearly Cycles of the horoscope owner. The fact that certain hexagram(s) appear more often, and others don’t appear at all as yearly hexagrams, can be very illuminating. Seen like this you could interpret them as ‘life lessons’. By the way, you can notice some very interesting features when analysing horoscopes of VIPs. For example, according to hexagram statistics for Bill Gates you can see that the first hexagram “Ch’ien. The Creative (Innovatory) Action” appears much more often than the others. The same is true for Nicole Kidman (VIPs are included in ‘Pillars). The statistics for Barak Obama on the first screen shot shows that hexagrams 42 “I. Increase (Gain)”, 43 “Kuai. Resoluteness (Removal)” and 44 “Kou. Contact (Relationships)” appearing more often than others. by New Pillars of Wisdom release. From now on with I Ching hexagram reference. | Four Pillars of Wisdom. I Ching Astrology Software.